MASA is a sprawling, at times messy, but essential snapshot of the African arts landscape. An emormous burst of energy with everything happening at once. The biennial festival in Abidjan showcased and marketed the work of hundreds of artists over the course of 9 days this past March. Emerging artists in the music sector most represented Francophone nations and established artists with new projects were selected by jury to perform for industry professionals and the public. Words from P-Pentatonique bio: "trance & groove" where the village invites itself to the city, a meeting of Wassolou's pentatonic music, desert blues, and rock, well beyond Malian borders. A "stickfight" scene from Brooklyn based Trinidadian carnival band Jouvayfest performance for an audience of thousands of schoolchildren at the Palais de la Culture, Abidjan. JouvayFest also opened the festival with a parade through the lively streets of Treichville to the Palais de la Culture. The paraders made up of rhythm section, steel pan, members of Pagwah Jouvert band and Something Positive dance company. Ahmed Fofana and new project P-Pentatonique, a fusion of modern and traditional Malian sounds. The Palais de la Culture sits on the edge of the Ebrie lagoon, across from the densely packed highrise buildings of Plateau, the central business district. It was the hub of MASA activities with stages also located in neighborhood venues across the city. First impression coming into the Palais de la Culture was a bustling crafts market and a collegial atmosphere where people greeted each other and talked about current projects. Artists from Cameroon, Mali, Congo Brazzaville, Cote d’Ivoire, Senegal, Cape Verde, Gabon, Nigeria, Democratic Republic of Congo, Benin, Madagascar, Haiti, Jamaica, USA, nearly all were new to me so the notes are based on short sets on and a few words from the artists afterwards. The schedule allowed listeners to hear a half dozen shows a night, many exploring the give and take between tradition and contemporary approaches. Lornoar’s voice literally stopped me in my tracks, it floated sensuously across the palais grounds over the barebones rhythms of her band's afternoon soundcheck. Her set that evening was outstanding with her voice complemented by some energetic dancing. Afterwards, I found out she won a Cameroonian nationwide singing contest in 2010 which was followed by her first album in 2012. She later toured in the US, playing New York venues including the Zinc Bar and recording her second album here with Francis Mbappe. Ibaaku, from Senegal, an innovative Afrofuturistic electronic producer performing live at MASA 2018. His sounds, define a new generation evoking he says a "Memory of the Future". and can be found on Alien Cartoons, his Akwaaba release. Tony Mefe, Scene d'Ebone director told us that its mission is threefold: (1) A program through which we help young artists to give a market value to their productions and to better organize themselves, (2) International Exhibition Voices of Woman, an annual showcase, the second edition to be held in Douala, May23rd-26th 2018, includes 22 artists. (3) Escale Bantoo, the traveling international promoting the music of Central Africa outside our subregion, including MASA, and the upcoming Visa For Music in Rabat and a planned US tour. Lamine TPJ, coupe singer and choreograper and dancers (L-R) Mariam Soumahoro, Gnagno "Marie Antoinette" Bahon and Sara "Coulibaly Mama" Victoire in action outside of his address just off rue Princess in Yopougon. Each band performed on at least two stages over the course of the week. while the nearby Scene Bantoo was a comfortable afterhours hangout spot with three sets each night including rising young artists from central Africa including Queen Koumb (Gabon) Ndabott Familly (Cameroon) Gwen and Tiana (Belgium/Gabon) and Licelv Mauwa (RDC). Scene Bantoo was sponsored by Scene d'Ebone, a Yaounde Cameroon based organization dedicated to supporting Central African artists. Cape Verdean vocalist Maria de Barros, performing barefoot as did her godmother Cesaria Evora, and her band on stage at MASA 2018. She is also putting the finishing touches on her 4th album. Luminous Coladeiras, both fast and slow, had the crowd swaying, before she finished with a driving funana. The warmth relaxed welcoming "Morabeza" Maria de Barros expresses on stage is genuine. We met in the airport arriving in Abidjan on the same flight and picked up a conversation that was begun years before without skipping a beat. Maria de Barros life's experiences, she was born in Senegal, grew in Mauritania, and Providence Rhode Island before settling in California are not atypical for a Cape Verdean, a culture born of restless seeking. Separation, and longing for home, the small group of islands in the Atlantic Ocean 300 miles off the coast of West Africa are themes that reoccur in the music. While that is present in her music, it is the warmth of Cape Verde one hears, steady as the breezes, expressed plainly in the elegance of her voice, graceful stage presence and the excellence of her musicians. Cameroonian vocalist Gaelle Wondje performing songs from her new album "Ening" at Scene Bantoo. 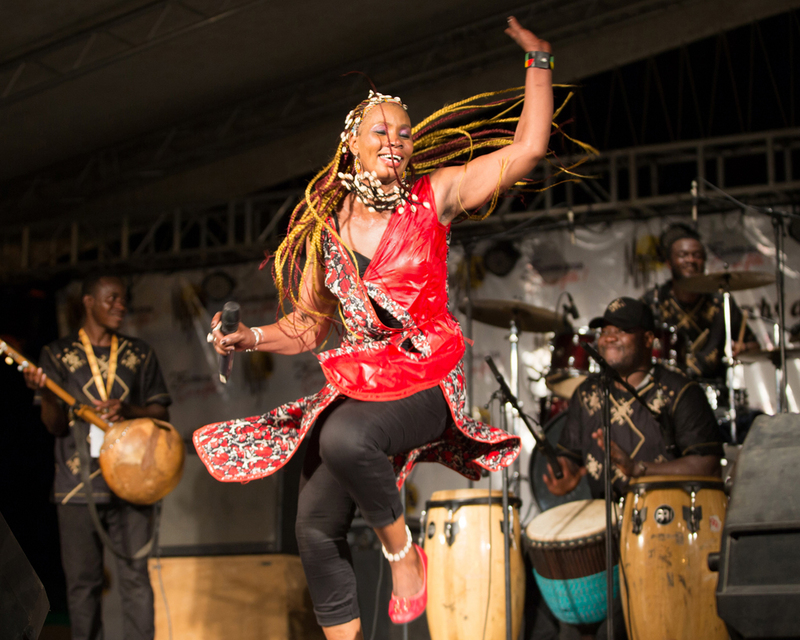 Wondje is touring as a leader after years of work with other artists, mixes makossa and world rhythms, knowledge gained from her experience collaborating with international artists. The daughter of a guitarist, Gaelle Wondje cant remember not singing. Makossa afrosoul compositions and lyrics conveying the emotions felt in daily life, sung in Duala and French left a lasting impression. Many of the songs were from her latest release "Ening" produced by Armand Biyag and featuring Monique Meta (on Une Fois de Plus). This is her second album, but she is stepping out as a band leader after years of collaborating with other artists. Lamine TPJ, left, a couper decale artist says piracy remains a problem in Cote d’Ivoire, with performance as the only solid source of income. Downloading music is not as prevalant, people prefer to buy CDs' n part because of spotty internet access. This affects independent artists more severly than those on label. Lamine TPJ and his dancers perform most nights and tours internationally. Mai Lingani, inspite of these difficulties, traveled to MASA to announce her new album ‘Tangare’ produced by Bashiri Johnson. She may follow it up with perfomances in North America. Tony Mefe agreed saying "Piracy of works is a major plague for artistic creation in French-speaking Africa in general and for music in particular. While legally prohibited, no provision is made by states to eradicate it. Pirated musical works are sold by street vendors on the sidewalks and even in the offices of the public administration. 9 out of 10 CDs or DVDs sold in Francophone African countries are pirated works." Mefe also mentioned howthe cost of travel keeps bands from touring. "It is extremely complicated to travel to Africa. It is certainly the continent where the air ticket costs the most expensive. There are many festivals but it must be expensive to travel unless there are more dates." Bendia leader Baba Toure on djembe, and Mamou Kone, a Malian griot on vocals. 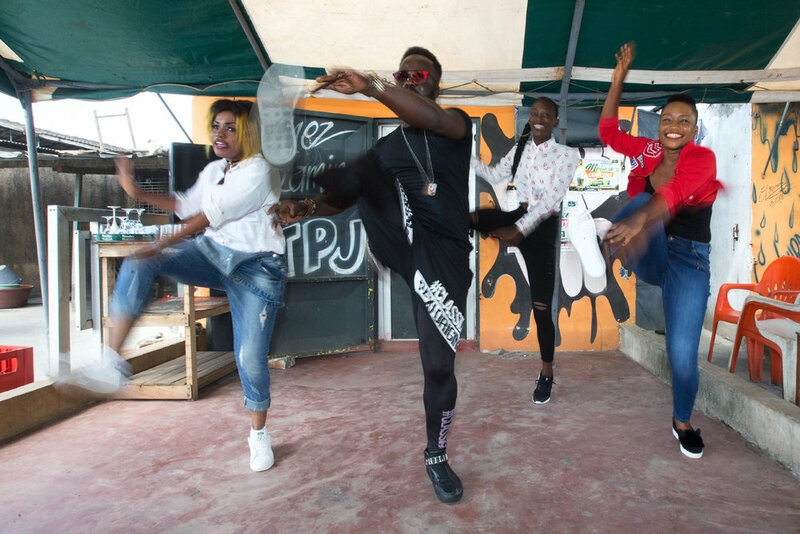 The Abidjan based dance troupe draws on the dynamic urban culture found in Abidjan, expressive of the multitude of ethnic traditions present in the city. What an entrance, a line of musicians walking on to the Esplanade Lagunaire stage using common kitchen utensils as percussion instruments. Ta-tata-tata, which introduced Oren'thcy's voice. It didn’t feel like an attempt to be avant grade, rather using humor beneath which was a serious massage, not unlike the way calypsonians use humor to make a point. Perhaps he is tweaking traditions because the music seems to embrace storytelling in its performance. The pace picked up as metal cups and soup bowls yielded to Balafon, guitar and various percussion instruments from the five musicians. The narrative was taken up by dancers, their costumes changing with each piece and pointing to themes of village life of southeast Cote d’Ivoire .The music is rooted in the Abodan rhythms and traditions of Southeast Cote d'Ivoire. Scenes of everyday life were portrayed in dance with a dash of humor by Orent’chy and three dancers.Orent’tchy’s engaging choreography blends in modern elements, electric bass and guitar alongside of balafon, drums and hand held percussion instruments would make an exciting dance/theater presentation. Vocalist Dambara from Segou Mali, a group of young musicians playing traditional instruments, calabash, bara, balafon, djembe. Traditional music of his region played with the emotion and energy of rock music Dambara’s vocals were urged on by piercing screams from Sadjo Sidibe, left, a Sonrai tradition. Originally meant to give strength to the kings going into battle. The call and response electrified the audience. 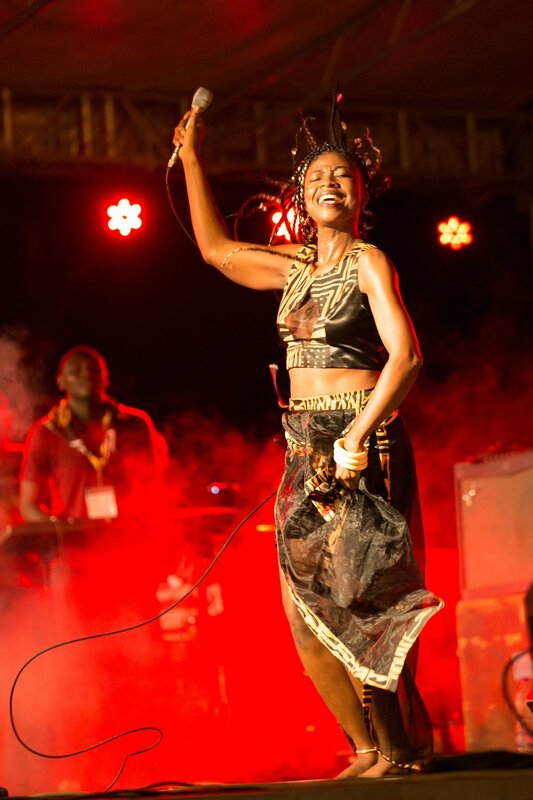 Myria Bika'A, a Cameroonian singer performing at the 2018 MASA festival. Her voice had a smokuy raspy quality and ranged from a whisper to blues tinged shouts which hinted at serious content in the words. Her band stayed out of the limelight whose work as a unit was riveting in an understated way. Myria seemed focused on declaring a personal vision or a soul bared, distinctly Cameroonian, but nether traditional or pop. Brown Rice Family delighted their Abidjan audience in their first appearance on an African stage. Faraji's set touched on smooth reggae rhythms as well as soulful R&B bringing Marvin Gaye to mind. He has made an inpact in both the US, as well as collaborating with top artists and producers in Jamaica. Cheicknè Taman Dourou cfrom the Koulikoro region of southeastern Mali featuring griot Yah Kouyaté lead vocals and band leader Cheikne Sissoko a 7th generation Tamen drummer. Yah Kouyaté lead vocals, band leader Cheikne Sissoko on Tamen drums, Assaba Dramé on djeli n'goni, Amadou Keita on balafon, Youssef Koné on calabash and tamen, and Ousmane Boya on Yabara performing the music of sotheastern Mali, the Koulikoro region. Cheikne Sissoko, master drummer, and his band, Cheicknè Taman Dourou, delighted the audience with a set of the sounds of the griot traditons that his family has been known for for seven generations. Lead vocalist Yah Kouyate also grew up in a family of griot musicians, and leads a modern, popular ensemble. Ezza, a Tuareg bass, drums, guitar power trio in the blues rock vein, fronted by Omar Adam Goumour the guitarist from Niger. The band came together in France where Goumour met Algerian bassist Menad Moussaoui and drummer Stéphane Gratteau. EZZA's music speaks of Niger and Tuareg culture. The band did not deviate from its straightforward rocking approach throughout his 2018 MASA set. The self taught guitarist and leader Omar Adam Goumour formed the band in France where he met Algerian bassist Menad Moussaoui and drummer Stéphane Gratteau. Ezza takes its name from the last letter of the Tifinagh alphabet, EZZA is also said to be a symbol of the free man (Amazigh) and resistance. David Tayorault, one of Cote d'Ivoire's most popular singers wove rhythms from across the continent into his set at the 2018 MASA festival in Abidjan. Soul Bangs, from Guinee Conakry led by singer Souleymane Bangoura, performing at the 2018 MASA festival. Old car tires were strewn across the stage and gas containers painted black with flourescent yellow spelling out the bands name. Behind Souleymane, four male dancers zig-zagged loosely choreographed routines, while the musicians stayed in the shadows laying down keyboard laden afro-soul grooves. Judging by the number of faans that breached the barriers and mobbed the performers backstage their upbeat and unpretentious personality is making waves beyond Guinee.